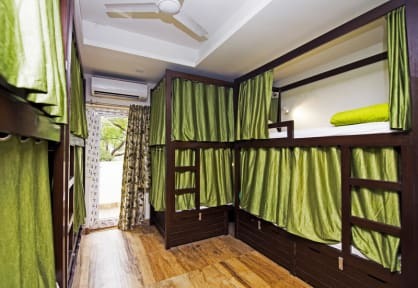 Joey's Hostel New Delhi i New Delhi, Indien: Reservér nu! Cancellations prior to 3 days before arrival can be done for free. Anything after that will be charged for the first night for the full group. Vandrerhjemmet er omkring 7 km fra New Delhi station og omkring 20 km fra lufthavnen i bil, men den mest bekvemme måde at komme her er simpelthen at tage Delhi metro og gå fra stationen. Sammen med dette, vil du finde en livlig fælles område at møde andre rejsende i. Vi har en dejlig personale ivrige efter at hjælpe dig med hvad du kan få brug for at forhandle overbelastning, at en by som Delhi kan give til dine sanser. 3. Både kontante andCREDIT kortbetalinger er acceptable ved ankomsten. 4. Afgifter er inkluderet i prisen. 5. Mindst 3 dages varsel til gratis annullering. Eventuelle annulleringer efter dette, vil vi tage plads leje for den første nat. Great stay at Joeys. Easy to find and fine rooms and beds and breakfast is free. The greatest staff who Will do everything to make your visit in India even better. They arrange tours and Will also help you find the Best experiences on your own - whether you want to go to the south og up north. All in all a good stay at Joeys with a lovely atmosphere . The owner is an amazing guy who makes you feel very welcome. The area is a outside the areas you wanna be, but the metro makes up for it. It's easy to get around. You have lockers, AC and very nice bathrooms. He also arranges tours. beer pong on the roof top etc which is nice for socializing.